Are you looking for a free contact form plugin for your WordPress site? Contact Form 7 is one of the most popular WordPress plugins installed on more than a million websites. In this Contact Form 7 review, we will take a look at its features, ease of use, and support options. Why Do You Need a Contact Form Plugin? WordPress comes with a robust system to publish content and interact with your users through comments. However, it does not come with a built-in contact form. This problem is solved by plugins. Contact Form allow your users to reach out privately. Email is the most easy and private form of communication on the internet. Adding a contact form to your website not only opens door for users, but also for new business and employment opportunities. Having a contact page on your website is simply too important to be ignored, and a contact page is incomplete without a contact form. There are several great contact form plugins are available for WordPress. There are both paid and free plugins available. If you are looking for the premium features of a paid plugin then we will recommend you to take a look at WPForms or our Gravity Forms review. Contact Form 7 is the most popular free contact form plugin for WordPress. 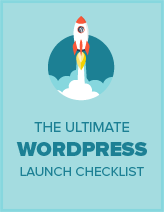 It is immensely popular and one of the most downloaded WordPress plugins of all time. Let’s see how Contact Form 7 stands out in our feature, ease of use, and support analysis. Contact Form 7 using the standard WordPress practices and integrates beautifully into your admin area. It also comes with a demo form that you can look at to learn how to create your own forms. The main form editor interface looks very much like text editor on the post edit screen. It has simple buttons on the top menu which you can use to add a form element. Once you are done creating your form, simply click on the publish button to make it ready. Contact Form 7 will give you a shortcode to insert the form anywhere on your WordPress site. Contact Form 7 is a powerful plugin. Each form created with Contact Form 7 can have different settings configurable from the Mail, Messages, and Additional Settings tabs. On the mail settings page you can define where to send the responses collected by the form. By default, Contact Form 7 sends each form submitted to the admin email address. You can change that to any other email address you want. Under ‘Messages’ tab you can change the default messages Contact Form 7 shows to you and your visitors. These messages are validation errors, input errors, success and failure messages on form submission. The additional settings tab allows you to send specific code in pre-defined format. Creating complex forms with Contact Form 7 is possible but not quite as easy. You can use the buttons on the form editor to insert input types and form elements. However, there are no advanced features such as conditional logic or payment processing, which you can find in other plugins such as WPForms and its add-ons. 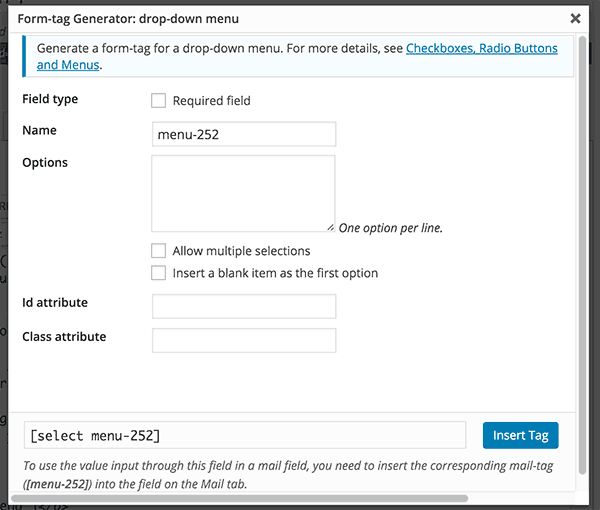 Clicking on an element would bring up a popup where you can select basic options for that field. For example you can mark required fields, add placeholder text, and configure them based on the input type you are adding. 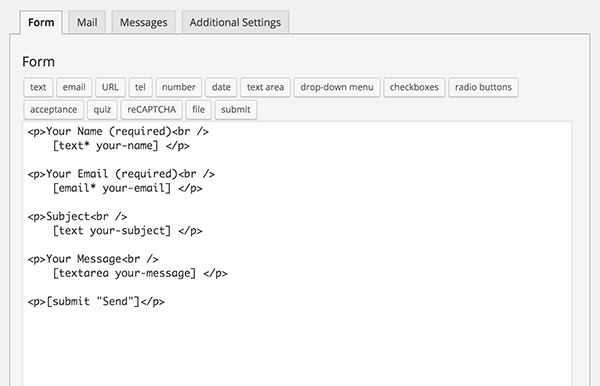 You will still have to write the HTML like paragraph and line break tags to properly display your form. The overall user experience during the creation of a complex form with Contact Form 7 is not good. However, if you have basic understanding of HTML and contact form 7, then it is one of the most powerful form builder. 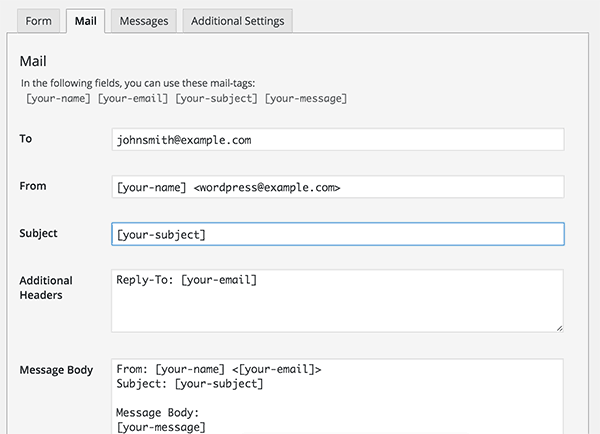 Contact Form 7 automatically inherits your WordPress theme’s style. Most standard compliant WordPress themes come with styles pre-defined for form fields and buttons. Some premium WordPress themes come with pre-defined styles mainly for Contact Form 7. However, if you need you can always add your own custom CSS. Contact Form 7 adds CSS classes and ID to all forms. You can use overwrite these default classes in your WordPress theme or child theme. Take a look at this tutorial on how to style Contact Form 7 forms in WordPress. 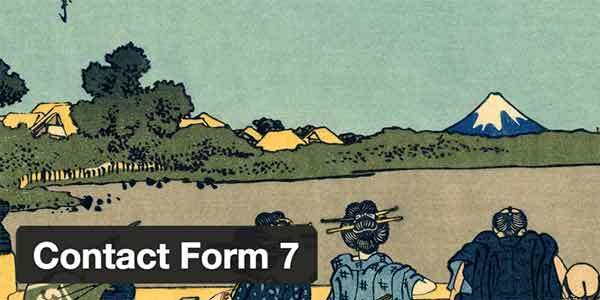 Contact Form 7 lacks several features that are commonly offered by paid form builder plugins, like Gravity Forms. However, Contact Form 7 is open source and highly extensible. Many WordPress plugin authors have created their own addons for Contact Form 7 which extend its capabilities. For example, the author of Contact Form 7 has written an excellent addon called Flamingo. It allows you to save responses submitted by CF7 forms into database. To find other addon plugins, simply search Contact Form 7 in WordPress.org plugins. Contact Form 7 comes with extensive documentation. First you have the built-in contextual help available right inside your WordPress admin area. Apart from that, more detailed documentation is available on the plugin’s website. Most of the documentation is in plain text format available in English and Japanese. Users can also submit support queries through official WordPress support forums as well. However, free support is not guaranteed. Contact Form is a very powerful plugin. It is a very strong alternative to premium paid plugins in the same category. It comes with extensive documentation and has good community support which ensures that it will be around for a long time. It is also fully translated into many different languages. However, it lacks many features that are offered by some paid plugins. It is also not very easy to use for beginners. It is well documented but if a user needs extra help, then support options are limited. We give it 3.6 out of 5 stars.